This is a great addon which allows players to receive any items without activating the creative mode. In addition, the Infinite Items hack works on user or realms servers, which is why many administrators panic and block cheaters. How to use the Infinite Items? 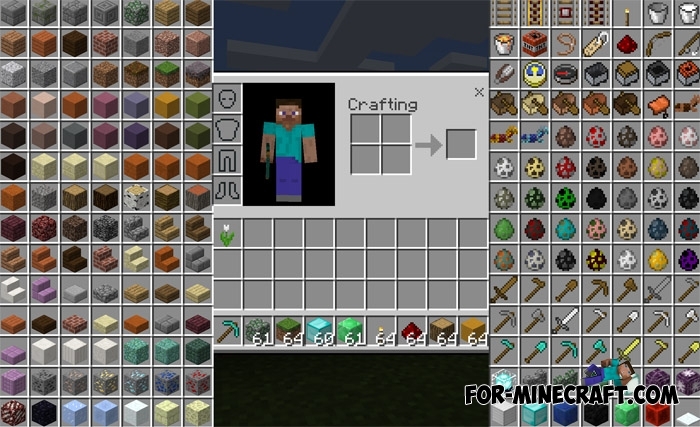 First, download and install this addon then start your world and open the inventory. You will see a panel of objects on the sides of the screen, choose any items and add them to your inventory. In this way, you can do absolutely anything, build huge houses or blow up neighbors. The hack works on the principle of the creative mode which makes it very convenient and fast. Warning: developers should fix this bug and take some measures to block cheaters, so if you play on servers then use this cheat at your own peril and risk. At the moment, administrators can not notice this hack, but a huge amount of resources will definitely give them a signal. This mod is really cool I am so exited to get the mod!!!!!!!??????????????? Omg this mod is like sooooooooooo coooooooooooooooooooooool!!!!!!!!!!!!!!! !